Camping is simply one of those activities that you love or hate. True camping aficionados will do it year round regardless of temperature or terrain. However, most people who enjoy camping are fine weather friends to the activity. They enjoy camping when it is warm and dry outside and love the opportunity to be at one with nature. Nothing beats the sound of falling asleep listening to the peaceful sounds of nature, unless of course you prefer to be lulled to sleep by the sweet hum of an air conditioner. When you embark on a camping trip, there is always the question of what to wear and it is closely tied to the fact that camping requires a lot of packing. 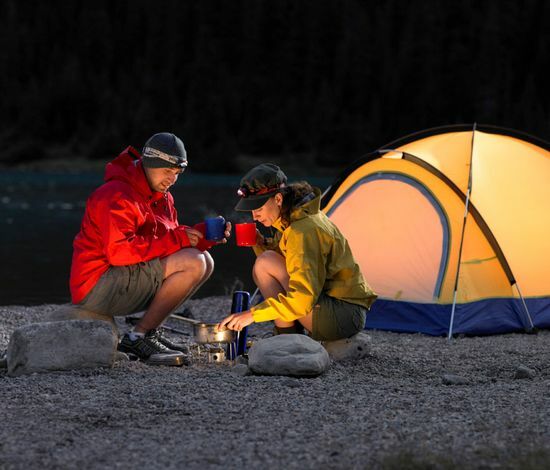 Therefore you want to make the best use of the clothes you choose to bring camping by opting for multi-purpose clothes. It is also important to bring clothing that you can layer. If the night turns cold you will want to be able to add another layer and keep warm. Bringing a warm-up suit that can be used to sleep in is a great choice in terms of versatile clothing. Another thing to keep in mind is the type of material the clothes are made from. It is important to choose items that can dry quickly and are lightweight. These will keep you comfortable and dry, while allowing you to do a little laundry by hand so you can wear these things repeatedly. This allows you to bring the least amount of clothes and saves packing space. It is also the perfect type of clothing to keep you cool and comfortable on warm days in the summer – the high season for camping. Be sure to choose protective clothing appropriate to the area you are going. You may need hiking boots or at least closed shoes to comfortably walk to the area in which you are camping. If you are planning to go to any of the areas where ticks are abundant long pants tucked into your socks and long sleeved shirts are essential choices. Even if you are not crazy about that fashion statement, it will keep you healthy. If your main choices for tops are tank tops, bring along a lightweight shirt with short sleeves to protect your shoulders from the sun at least occasionally. For most camping expeditions to less wild places, shorts, T-shirts, bathing suits and sandals or flip flops will be the uniform of choice. Many campgrounds are located on the water or have swimming pools available for use. You will want to bring a comfortable bathing suit that you can have fun in. Warmer clothing for the evening may still be necessary. Be sure to check the weather before you go to be sure that you know what to expect and how to be best prepared. By choosing your camping attire wisely you will have fewer things to bring along but will still be ready for anything that comes your way. Remember camping is all about fun and getting away from it all so don’t sweat the details too much. This is great. I’m taking my kids camping next weekend and we have never been before. I’ll take your advice above when we pack our clothes. ← What to Wear for Confirmation?